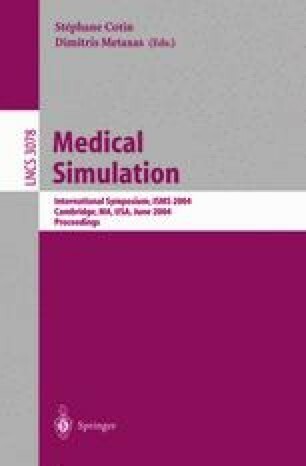 Computer assisted navigation and biomechanical modeling have made surgical simulation a new domain of research in the last decade. One possible operation that could benefit from this progress is the Anterior Cruciate Ligament (ACL) reconstruction. During this operation, the anterior cruciate ligament graft has to be placed in such a way that it is isometric during a flexion-extension and in traction when the leg is in extension. That is to say two constraints : a geometrical one and a physical one. We present a CT-Free navigation system that solves both these constraints in real-time and intra-operatively. With the combined solution, the surgeon will be able to know per-operatively if the graft placement will lead to a robust and effective reconstruction or not.